Temperature Monitoring There are 5 products. 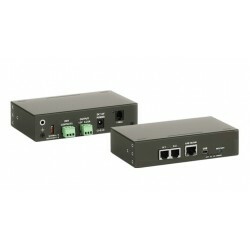 GSM (SMS) and Ethernet Temperature and Power Monitoring of Cold/Freezer Rooms, Server Rooms and many other applications. Receive a SMS or E mail alert when your Temperature goes high or low or there is a power failure. All types of condition monitoring available, inquire about your specific application. GSM (SMS) Server Room Temperature Monitoring unit. Small compact din Rail mounted unit, supplied complete with back up battery, power supply and 1 temperature probe .The unit is easilly programmed by SMS. The unit will send a SMS to up to 5 cellular numbers in the event of a high or low temperature condition as well as if there is a power failure. 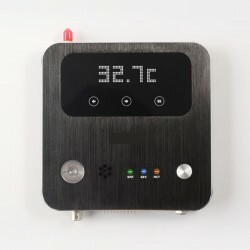 GSM (SMS) Server Room Temperature Monitoring unit. Small compact din Rail mounted unit, supplied complete with back up battery, power supply and 2 temperature probes .The unit is easilly programmed by SMS. The unit will send a SMS to up to 5 cellular numbers in the event of a high or low temperature condition as well as if there is a power failure. 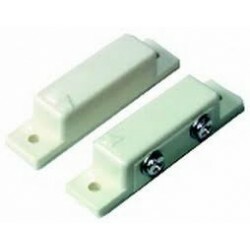 This magnetic Door Switch with 1,5m of cable which will give an open or closed signal. Ideal for using as a Digital Input on a controller. 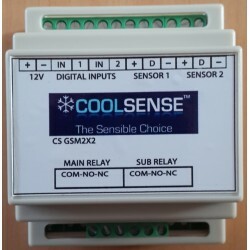 This Temperature Monitoring Unit is connected via an Ethernet Connection to send e mails in the event of a high or low temperature condition or a power failure. The unit is supplied with 1 X Temperature Sensor, Power Supply and Programming Cable. Option to add a USB modem to receive SMS alarms.